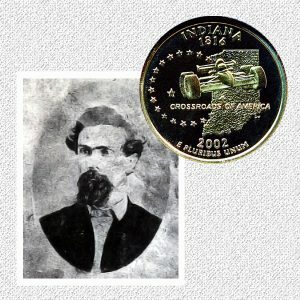 Today, the Indiana State Quarter Coin remembers when the Reno Gang robbed the Express train near Marshfield on the night of May 22, 1868. Shortly afterwards, though, a few of the gang were apprehended. William and Simon Reno, Brothers, the reputed leaders of the gang of desperadoes who have been robbing American express trains, are in the New Albany (Indiana) gaol for safe-keeping. They had a preliminary examination at Lexington, Scott County, Kentucky, on the charge of robbing the Adams express, at Marshfield, on the Jefferson Railroad, a short time ago. The proof was so strong against them that each was held to bail in the sum of 63,000 dols., and they were sent to New Albany for safe-keeping. A history of Seymour would be far from complete without more than a mere allusion to the dark days of 1865 to 1868, inclusive, and the scenes of lawlessness that were enacted in and about the town during that period. Situated at the junction of two great railways, connecting four of the largest Western cities, namely Cincinnati, St. Louis, Louisville and Indianapolis, it was of easy access to the camp followers, thieves, counterfeiters, garroters and confidence men who gathered at all railway centers to entrap the unwary soldier returning to scenes of peace. Here, too, was the home of the long famous—or infamous— Reno gang, whose daring feats of robbery have taken front rank in the pages of the criminal history of our country. Frank Reno. the recognized leader of the gang, was the oldest of five brothers, three of whom met their deaths at the hands of a mob; another has but recently begun his second term in prison, while the fifth has at all times been adjudged innocent of crime. The family was reared on a farm near Seymour, and, previous to the latter days of the war, were highly respected and prosperous. Frank was a strange compound admixture of good and evil, the latter trait predominating. Among his neighbors and every-day associates he was very popular, was strictly honorable in business transactions, and more than once he gave warning to friends of impending robberies about to be perpetrated by some of his associates. He was tainted with that dangerous doctrine of the communist, whose chief tenet is that the rich may be robbed with impunity, having more than their share. Perhaps, to the end that his conscience might find relief, he distributed a part of his ill-gotten gains with a lavish hand among the needy of his native town. It is the generally accepted belief that the Reno brothers themselves took little or no part in the petty robberies, burglaries and other thefts that were of almost nightly, and sometimes daily, occurrence from 1864 to 1868. They were, no doubt, however, cognizant of what was going on in that regard, but confined their personal operations to more prolific fields. Numerous bank and county-safe robberies, which took place in various parts of the country, during the period named, were, without doubt, their work, or that of some of their more skilled confederates. Marshfield, an isolated water-station, is situated about twenty miles south of Seymour, on the Jeffersonville, Madison & Indianapolis Railway. Here, at 11:45 on the night of May 22, 1868, while the engine was taking water, the engineer was surrounded by half a dozen men, one of whom knocked him down, while another presented a pistol to his head and threatened to take his life if he uttered a sound of alarm. The fireman shared a like fate. The robbers then uncoupled the combination baggage and express car from the train, and all were disengaged, getting on board; the engine with the baggage and express car were run northward. After passing Austin, the first station north, they forced an entrance to the car, overpowered the messenger, and broke open the safes. They were rewarded for their work in the capture of $90,000 in new notes. On, nearing Seymour they halted, and, leaving the engine and car on the main track, dispersed. Some eighteen months previous, a train on the Ohio & Mississippi Railway was boarded when a short distance east of Seymour by three robbers, said to have been John and Simeon Reno, and Frank Sparks. The messenger was knocked senseless, and after rifling one safe containing some $15,000, the other, containing $30,000, was rolled from the moving car. The robbers in this instance being close pushed, the safe and contents were recovered intact. The Indiana State Quarter Coin shows with an image of Frank Reno, one of the Reno Gang.